Well, it hasn’t been all that long since w/We’ve even officially met. Come Yule, it will have been a year. So there’s really not much to pull on for the idea of change here. Immediately, there was a sense of comfort with each other. It wasn’t hard for Him to remain in most of my waking thoughts, and pop up in dreams (though those seem not to have any significance outside of the emphasis on how much w/We think the other is pretty swell) shortly after I met Him. A few months later I cycled into my weird “I’m not ready, I can’t see Him, or talk to Him because I’m not ready”, effectively keeping Him at many arms’ lengths away. I probably slowed down the natural progression of the relationship, honestly. But He doesn’t seem to have been too phased about it. Our being with each other is quite relaxed. I feel like there’s no rush for anything, that w/We’ve got all the time in the worlds. After that, when I began to trust in the situation, in the relationship, that if I wasn’t ready, He wouldn’t have come, it’s been quite lovely. The summer has brought the abandon of worry since physical labour tends to take away some of the over-thinking since I’m more tired. Honestly, the feel of the relationship hasn’t changed much over the year, it’s just been easy, comfortable, and warm. He’s usually always around, quietly, but I feel Him there. I’m looking forward to the winter months, when people aren’t as easily able to bug me (lol, I loved all the family and friends times this summer, but I need lots of alone time! ), when I can focus a bit more on Him as I make my Yule gifts, and then nice things for the household after Yule. I know He’s going to be busy with the Hunt this year, but He knows He can come to relax with me, because, really, I’m pretty mellow, and am usually content to sit silently with people, enjoying the quiet company. And if He wants to sit and chat about other things, I’m all ears. I just really like this Guy, ok? He’s pretty awesome, and o/Our time together has been quite lovely so far. This topic is interesting. I don’t tend to ask very much from Whomever I work with. Usually it is aid in whatever magic I perform, but that feels more like business than what the relationships I have with Them is like. There’s gebo when I ask for help with my workings, offerings and prayers. Not that there isn’t any of that any other time, because there is, the three of Them have Their days during the week on which They get candles, or incense, sometimes food and drinks. Ok, ramble-ness aside… the point is I don’t usually ask for much, I just enjoy His company. I believe I have mentioned it before, but for a while, I was relying heavily on my tarot deck to communicate with Him. He stopped in June. It is only for important confirmations. He has stopped me from relying so heavily upon the deck, and pushed me into relying upon my own “hearing”, “sensing”. He wanted me to trust myself and Him when it comes to communicating with Him. And that is a hard thing to do. However, I can see what the benefit is already. My “ears” aren’t always tuned into Him or Them, but when He needs to say something, I get it. Sometimes it comes like a thought, filled with words, sometimes it’s a vision of how He’s reacting, or a vision to just get my focus on Him so that He can let me know what’s up. It’s still hard to trust in what I experience. I don’t think that goes away, if it only ends up being a very quiet whisper in the background. Sometimes I pretend that something is more important than it seems so that I can resort to my deck. Yet jumbled up and meaningless replies come out of it. Ok, Baldr. I will endeavour. But only because You are worth it. So, you may be wondering why two posts are being put into one. XXIII is supposed to be a piece of writing that I wrote myself for or about Him, however, I do not have the mental bandwidth at this moment to write anything creatively, and I’m not about to put something out into the world that I think is crap about Baldr. 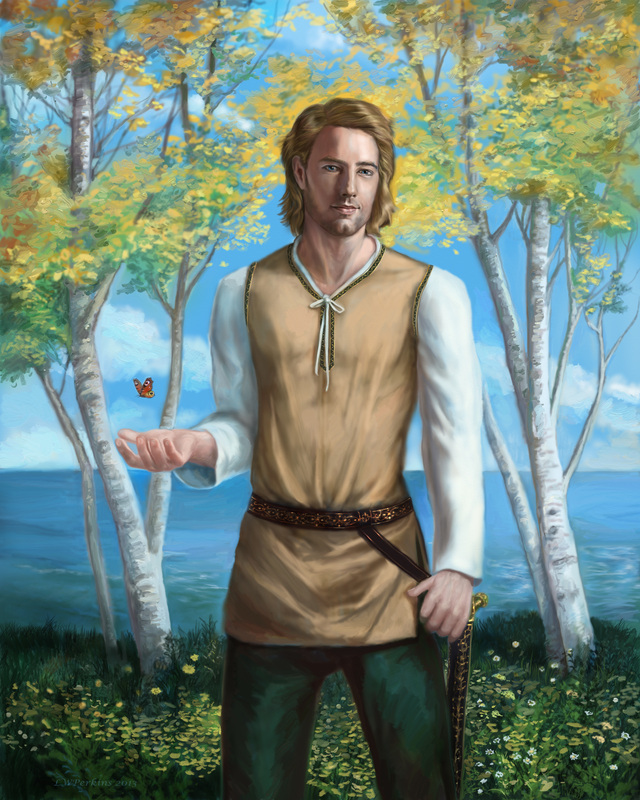 In this post, I’ll share a time that Baldr has helped me. So I’ll relate my experience with my usual… let’s call it malaise… at the end of the summer. Last year, before I met Baldr, I had about a month and a half of a pretty depressed state. It wasn’t as bad as what I had had when I lived out West, especially during the winters, but it was icky enough. Very deadening. About a week ago, I had been feeling that coming on again. Now, I have been noticing that weather really affects me since returning to Ontario. Big storms give me headaches, the humidity really brings on a very lethargic mood. It was dark, rainy, and dreary (almost like Vancouver weather, honestly), and I was slipping back into that icky place. Now, I have been quite lucky this year as no depressive moods had come over me so far, so I figured it was about that time for one anyway. Well, Baldr kept popping up in my thoughts, stuck around, where it is usually hard for me to feel connected to any of Them. He wasn’t being pushy, just remained with me. I endured the week, sleeping lots, but still going outside to look in the garden, to be with growing things as thoughts of green filled me. He was there, gentle, but supportive, moving me forward to see that I still have my obligations to Him, to Them, and to my mortal kin. It’s ok to take time for myself, and honestly, this summer has been so busy and filled with people. As someone who generally avoids the overstimulation that happens with many people like the plague, this summer has pushed on that a bit. Granted, most things involved family, so situations were filled with people I know and like, it’s still difficult to have to just continue talking about things, having to find interesting things to say even though I’m quite far removed from what’s considered “normal”. And yet, He showed me the benefit in that, in being with those who care, with sharing things with them, and hearing what they have to share in return. It has been busy, yes, but not as draining as I would have expected such a people filled season would be. I would come back to Him after it was all done, and w/We’d just be, just enjoy each other’s company. You have been an inspiration to me, Your joy, Your humour, Your gentleness, Your passion. I am blessed to have You in my life, to go with You on o/Our adventures, and to just be with You when w/We both just need to relax or be silly. I love that o/Our relationship is unfolding slowly, each moment with You a gift. I have so much excitement for whatever comes as w/We continue walking forward on this path together.